"Born for This: The BeBe Winans Story" is a melodic telling of the journey to fame for the six-time Grammy winner with his sister, CeCe. See it at D.C.'s Arena Stage. WASHINGTON — These days, the Kreeger Theater at Arena Stage is full of people laughing, clapping, crying and singing along to the musical “Born for This: The BeBe Winans Story.” It’s a melodic telling of the journey to fame for the six-time Grammy winner with his sister, CeCe. The two African-American Detroit natives — and the two youngest members of the gospel singing Winans family dynasty — turned the music world on its head as their songs turned up in unexpected places. BeBe Winans is grateful for their success, and credits Jim and Tammy Faye Bakker for putting the close siblings on their television show, “The Praise the Lord Club,” in the 1980s. BeBe and CeCe moved to North Carolina, and this coming-of-age production highlights the huge cultural changes the association brought to their lives. 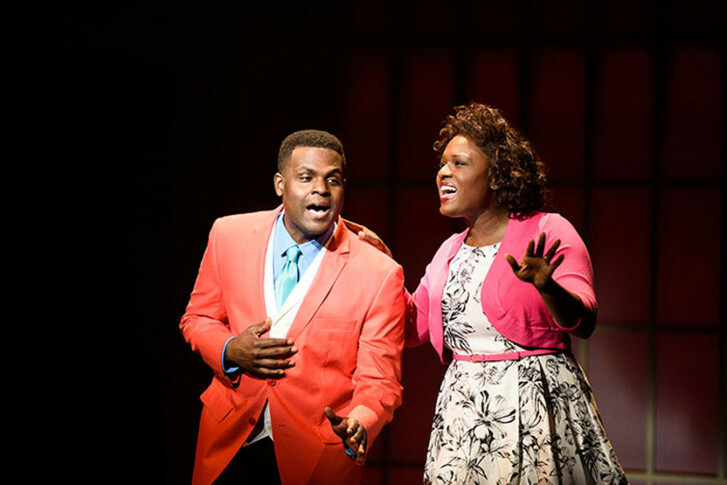 The parts of BeBe and CeCe are played by their nephew Juan Winans and niece Deborah Joy Winans. Deborah tells WTOP that in doing this show, she learned a lot about her aunt and uncle’s lives. “I started to realize the effect they had on music, on people … [and] I learned what it took for them to have that effect and all the things they went through in the 80s in North Carolina,” Deborah Joy said. One of the challenges for Deborah Joy has been singing the part of her virtuoso, big-voiced aunt CeCe, who can blow an audience out of their seats with her powerful instrument. There are some stand out moments in this popular show: Kristen Wyatt’s Tammy Faye Bakker’s character cracks the audience up, and Kiandra Richardson as a young Whitney Houston draws gasps from the audience for the eerie accuracy of her voice and mannerisms. BeBe Winans says this production is exciting because he believes the audience sees their lives on stage as well. “That’s what we wanted to accomplish. Everyone has a purpose behind being here on the planet earth,” he said. Deborah Joy called “Born for This” a spiritual experience. “Born for This: The BeBe Winans Story,” runs through Aug. 28. Tickets are available online at Arena Stage’s website.